Arunachal Pradesh Chief Minister Pema Khandu on Saturday said the people must realise that the delay in the execution of Potin-Pangin road project was not due to any lapse from the Centre but from the State government. The project was in suspension after the Concessionaire gave fore-closure notice to the Ministry of Road, Transport and Highways (MoRTH) on February 2 last year. The High Powered Inter-Ministerial Committee on Special Accelerated Road Development Programme for North East (SARDP-NE) had on Thursday cleared the proposal of Rs 3988.98 crores for the road. 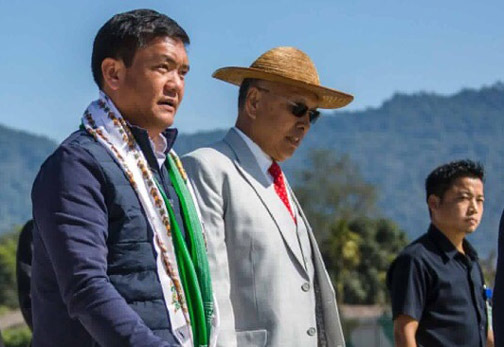 “The work was allotted in 2012 without any proper norms and land acquisition process being completed, however, under the present government, the entire process of project execution is being overhauled and wherever misappropriation of funds and norms has been overlooked they are being corrected,” Khandu said. He was addressing a large gathering at Pobdi village in West Siang district after inaugurating the third leg of Arunachal Rising Campaign. The chief minister informed that the Centre has sanctioned funds for the projects in three packages for which the tender will be executed by February 9 next. “The pending Potin-Project has caused huge expenditure on the state exchequer with Rs 60 crore being released for the maintenance of the road. That money could have been used for public benefit in the field of education or health had the road project not gone through such vast embezzlement,” the chief minister said.